American travelers over the years have become accustomed to a handful of hotel brands and their tried-and-true amenities-room service, fine dining and business centers-but the next generation of urban hotels, particularly those in emerging neighborhoods, are turning convention on its head. In fact, we are bearing witness to one of the most substantial transformations of the hotel industry since the 1970s, which saw the proliferation of business-centered hotels and hotel brands that began to offer more spacious rooms, more refined cuisine, and more modern amenities in response to customers’ wishes. With the Millennial generation now a significant portion of the traveling and working public, however, the modern customer profile has changed. Millennials want less, and with their mobile technology, need less. As such, hotels are limiting amenities and connecting to high-amenity neighborhoods to offer unique hotel products and genuine local experiences. The proliferation of Airbnb-an online marketplace that enables travelers to lease or rent short-term lodging-is behind much of the ongoing transformation. Travelers are turning to Airbnb, where they can find unique local travel experiences, rather than corporate hotel brands, which tend to isolate themselves from local culture. As a result, more and more urban hotels are taking cues from their surroundings. In cities like New York in the North and Louisville in the South-with their deep, rich economic histories and industrial enclaves-there are numerous adaptive reuse hotels that have drawn inspiration from their historic buildings’ early lives as warehouses and factories. 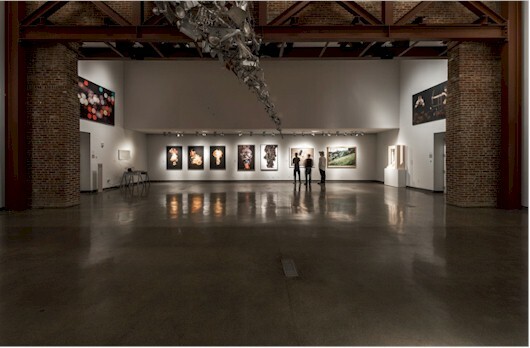 In the process, architects are putting the spotlight on industrial detailing like soaring ceilings, large windows, distressed hardwood floors, metal beams and the like, and complementing them with modern elements such as mosaic tile floors, leather, copper accents, and local art. Unique details are added that reflect the buildings’ former uses, creating genuine visual and experiential opportunities. The results are beautiful, earthy, experiential, memorable and relevant. The Paper Factory Hotel in New York, for example, features historic industrial details, original paper mill machinery, and book décor; while hat pin sculptures, scissor-patterned carpets, and desks resembling sewing machines connect Refinery Hotel to its 20th century roots as a Fashion District hat factory. In Louisville-one of the oldest cities west of the Appalachian Mountains-21c Museum Hotel reclaimed and reused much of the original 19th Century brick, timber and cast iron to reflect its historical bones. Local culture is also pervasive at 21c Museum hotel, where a restaurant and public contemporary art museum reflect the neighborhood’s recent creative movement, and create a bridge between hotel and local communities. In Brooklyn, NY the NU Hotel features loft-inspired minimalist rooms, hardwood floors and walls covered in street art to reflect the borough’s local culture. The hotel even commissions local artists to create the art and partners with many of Brooklyn’s popular community brands, such as Brewklyn Grind and Brooklyn Winery. Museum Hotel. Photo: 21cA structure’s history is linked to the building technology available at the time of its construction, and in young economic centers like Miami, there is a different take on what is considered historic. Many of Miami’s vintage buildings were established during prefab concrete construction era of the 1950s, so architects revitalizing these buildings tend to focus on creating clean, bright white boxes with art deco details and terrazzo floors. But, the main emphasis in hotels located in these young, vibrant cities tends to be local culture. In Miami, for example, destinations outside of the beachfront norms are making a debut. Emerging districts like Wynwood and Calle Ocho, with its nod to Miami’s Latin culture, have become destinations in their own rights, and as such have become prime sites for future hotel development. Urban lobbies are the bridge connecting the local environs with the hotel, and as such have become less transitional and much more meaningful. They create powerful and palpable connections between the local and hotel communities, and are designed to meet guests’ varied needs to work, rest, eat and socialize in a single environment. The design then must be open, minimal and efficient. Setting the tone with sensorial elements such as lighting, music and scent, they must also be warm and welcoming. Experiential historic and local details create an evocative opportunity for guests and locals, creating a vibrant community and a more authentic travel experience. The restaurant and museum at 21c Museum Hotel, whose downtown location has become the epicenter of contemporary art in Louisville, is the perfect example of this interplay. One of the current areas of innovation within urban hotels is the gastronomic experience. Since urban lobbies tend to be smaller, there is a much-needed flexibility in the way their food and beverage presentations are designed. At EAST Hotel in Brickell City Center, Miami, for example, a rotating wall turns the space from day to night, and at some Marriott hotels the bar changes its music and lighting to make the switch. Hotels that don’t eliminate food amenities altogether, relying instead on local food options, are simplifying their onsite offerings. Marriott, for example, debuted healthy vending machines with handcrafted salads and sandwiches, and many have simple organic, seasonal and locally-sourced menus to attract guests and locals alike. The Chicago Marriott Downtown Magnificent Mile has taken the local approach to the next level with a rooftop garden and its own crafted pastas, cheeses and cured meats. Hotel guests can even stomp grapes in the lobby to make their own wines. Like the transformations that business travelers ushered into the hotel industry in the 1970s, the remote and digital nature of today’s business traveler is one of the main reasons behind this new common lobby. Many business travelers prefer to work beside like minded individuals rather than in private rooms. As such, hotels have been abandoning business centers in favor of varied seating options in the lobby that include adaptable furniture, privacy walls, electrical outlets embedded in furniture, and free and fast WiFi. AC Hotels by Marriott recently launched a partnership with one of the world’s largest startup communities, Startup Grind, so entrepreneurs, traveling or local, can enjoy their own community in a European-inspired environment that provides well-designed and inspirational places to work. As day transitions into night, the space transitions its food and beverage options to create a more causal, social buzz. The social aspect of lobbies is only gaining speed. Lobbies are becoming much more social with hotel-curated social events such as wine and trivia hours, and special rooms for ping pong and billiards games. Sometimes rooftops are getting into the act with rooftop movie nights like at New York’s YOTEL. Social media marketing is a significant part of this social movement; and while the U.S. has yet to see Twitter-themed hotels, like Spain’s Sol Wave House, or Instagram-inspired hotels, like Sydney’s 1888 Hotel, hotels stateside must be designed with social media in mind. This means creating hashtag campaigns that align with curated social events, and Instagram-ready features like infinity pools, rooftop bars and hip, stylish rooms. Marriot’s urban brand Moxy, for example, curates guests’ photos of its hip interiors via the #atthemoxy Instagram campaign. Social apps like LobbyFriend-a temporary social network app that provides local information and send messages to other guests-are also gaining ground. One of the most significant transformations within the hotel industry, however, is interactive design. Hilton, for example, has successfully employed mobile room selection and check-in for its Hilton Rewards members. Other hotel brands are introducing robotics and biometric identification to transform the guest experience. Starwood’s urban-inspired Aloft brand is testing touch screens that control HVAC and lighting at some locations, and in Cupertino, CA, the hotel has a robotic butler that will deliver towels poolside. At the small but high-tech YOTEL hotel, a robot stores guests’ luggage and a motorized bed will fold up to provide more floor space. Hoping to catapult its brand in a city that has become an international hub for travel, Strategic Hotels & Resorts’ InterContinental Miami has created an impressive interactive experience. In addition to two 19-story exterior LED canvases that can be seen for miles, the hotel lobby features personalized pods with adjustable lights and music; coffee tables embedded with tablets with local content; and a live feed of Downtown Miami that stretches the length of the registration desk. 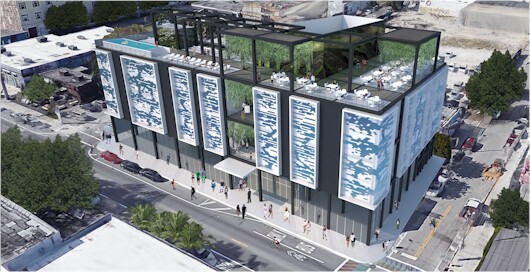 Hotel Concept in Miami’s Wynwood District – Photo: MKDAGuest rooms are taking a back seat to many of these lobby-centered amenities. Borrowing from the European model, urban hotel guest rooms are smaller than ever, but with a more distinctive minimalist design that is smart, efficient and pared down. Even large hotel brands are replacing cumbersome furniture and closets with modern open shelving, wall hooks and wall-mounted televisions to give the illusion of more space; Hilton has even created smart under bed luggage storage at its Tru brand of hotels. Room design is minimal and neutral, but punctuated with nods to a building’s rich history and local culture with art and décor that reflect the hotel’s history and locale. One of the biggest transformations happening with hotel guest room design today is with flooring. Urban hotels are replacing carpeting with area rugs over hardwood floors, laminate or ceramic tile, which are more cost effective, durable and clean, giving the added benefit of trimming operating costs and extending more affordability to travelers. Despite the stripping down of room amenities and luxuries, there are two areas in which guests will demand more: the bed and bath. Crisp, white bed linens, some in organic cotton, will become the norm, while spacious spa-like bathrooms with walk-in showers and rain showerheads will replace the oft unused bathtub. Photo: Refinery HotelAnd while fitness centers will be getting more attention from architects and designers as urban hotels evolve, travelers who prefer to workout in private, are in luck. Hotels like TRYP by Wyndham are integrating treadmills and stair climbers into guestrooms, along with a complete wellness program that include nutrition and meditation. At the Kimpton hotel, which bills itself as a unique and funky hotel brand designed to complement the cities in which they are found, guests can leave their room and explore their local environment on bikes, or enjoy daily community yoga classes. All of this innovation means that the once familiar and comfortable urban hotel brand is being replaced by a more authentic, immersive, experiential and, imitating the European model, clean, minimal and efficient hotel experience. American travelers may now feel that they will never step foot into the same hotel twice, and in my opinion as an architectural designer in the emerging Miami neighborhood of Wynwood, this makes the future of urban hotel design much more compelling.